A big thank you to all our clients for your support in 2013. In this issue we reflect on the wide range of completed projects that passed through our office in 2013 and upcoming projects in 2014. Congratulations to Tim Barnett and his wife Amie on the safe arrival of their son Jack Barnett. A warm welcome back to our Office Manager Kylie Chenoweth, who will be returning to work in February after being on maternity leave. Congratulations to Robert Bartosik and Anthony Davidson who were each presented with an Award of Commendation at the IES Lighting awards night on 30th November. Robert's award was for his work on the Main Corner Façade Lighting in Mount Gambier and Anthony's award was for his work on the Balcony and Meeting Rooms of the new Gerard Corporate Headquaters Building in Rose Park. 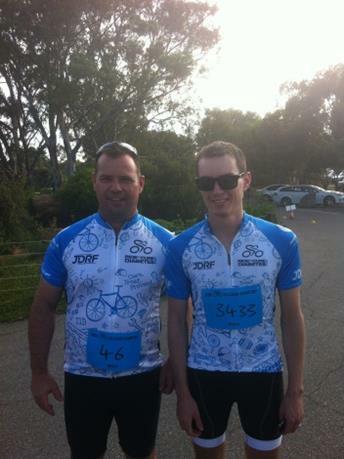 Once again Matthew Fechner and Andrew Burrow completed the JDRF – Juvenile Diabetes Research Foundation “Ride to Cure Diabetes” 2014 held in the Barossa Valley on the 18th of January. Matthew and Andrew completed the 80km course. This is the team's second year participating in the JDRF Ride to Cure Diabetes'. Team “1000 Needles” was born from Matthew’s very personal goal, and the "1000 Needles" a year his daughter needs to manage her Type 1 Diabete's care plan, however as the team has grown, new Diabete's stories have been added. Although our stories differ, our goal is the same - to help find a cure for Type 1 Diabetes. The 2014 ride nationally raised over one million dollars which is a fantastic achievement by all. So far the team has raised over $4,300. To make a donation go to - http://ride.jdrf.org.au/teamParticipant.asp?teamID=8 click on either Matthew’s or Andrew’s name to make a donation. Donations can be made up to 30 days after the event. Your donation will automatically generate a tax receipt. The “1000 Needles” Team 2014 – from left Matthew Fechner – Senior Consultant Hydraulic and Fire Services and Andrew Burrow – Senior Mechanical Engineer. Absent Matts Uncle, Glyn Schirmer who could not ride due to CFS duties fighting fires in the Eden Valley Fire. Secon was involved with 111 projects in 2013. These projects are listed by project type and can be viewed by clicking on the following link. Secon worked with over 85 clients in 2013. Well done to Chris Mantle of Chris Mantle Electrical Contractor who came up with the winning caption "Don't laugh, this could catch on". A bottle of wine or 6 pack of beer is the prize for the person who comes up with the best humerous caption for this image.